Ministry of Lands challenged to up its reform agenda – Kenyatta University TV (KUTV). All Rights Reserved. President Uhuru Kenyatta has today challenged the Ministry of Lands to up its reform agenda to propel the country to position 50 in the ease of doing business. The President said while the ministry had effected several positive changes, it still has a lot of work to do in its reform agenda. “And one Ministry that has got a lot of work to do is the Ministry of Lands,” said the President at State House, Nairobi, in an event attended by Deputy President William Ruto . President Kenyatta also expressed his frustration with some lawyers who have persistently defeated reforms at the Lands Ministry especially at the Registry. He told the legal fraternity to put the interest of the nation first because the registration of more businesses and genuine land transactions translates into more jobs for the lawyers. 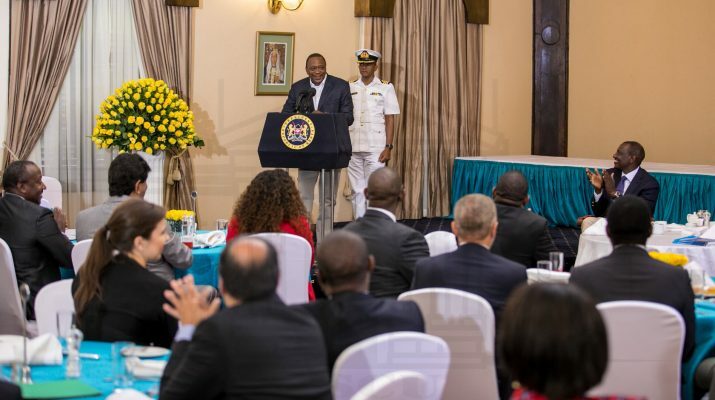 The President spoke during a breakfast meeting he hosted for various stakeholders who have worked tirelessly to enable Kenya emerge among the top 10 most improved countries globally in the ease of doing business, according to the current World Bank report. The stake-holders included the Kenya Private Sector Alliance (KEPSA) and development partners , among them Britain and the Netherlands. Cabinet Secretaries Peter Munya (Industry, Trade and Co-operatives ), Adam Mohammed ( East African Community and Northern corridor Development) and Mwangi Kiunjuri ( Agriculture) were among top government officials at the function. The World Bank Report-Doing Business 2019-ranks Kenya at position 7 among the 10 most improved economies in the Doing Business Index, a strong statement of confidence by the world about the economy of Kenya. The new ranking marks the fifth year-on-year improvement in the country’s overall ranking since 2014 (under Jubilee Administration), moving 75 places from position 136 to position 61. The World Bank report compares business regulations for domestic firms in 190 economies globally, reviewing various parameters over the ease of doing business that include the ease of getting credit, protection of minority investors, resolving insolvency, paying taxes and trading across borders. Turning his attention to the local media, President Kenyatta told the fourth estate, that, while the government is not worried about being corrected, the criticism should be positive and aimed at finding solutions. He added: “Let us be positive about our country. Let us criticize positively with a view of getting solutions not of highlighting division and bringing animosity,” said the president in a function where all the media outlets were represented. He cautioned that reckless media reports and criticism were likely to inflame ethnicity with the risk of driving the country to turmoil. He said some headlines and reports by the local media were quite frightening because they mostly dwelt on non-existence issues. The President said Kenya, like any other society, is not a perfect one but the media should always strive to project the best version of Kenyans. “Remember always that how you speak of the country will reflect on how we are perceived externally. We are not a perfect society, far from it but we are great people and we should always strive to project the best version of ourselves as a country,” said the Head of State. He said despite the positive WB report, Kenya’s reform agenda is not complete adding there is always room for improvement. He called on all stakeholders to continue working hard to address areas where the country scored poorly. The President noted that the focus on the “ease of Doing Business” has made Kenya’s business sector more productive and globally competitive. “Our investment levels have risen from $350m in 2013 to $2bn in 2017. We have more than doubled our collections of revenue from the companies registry from Sh150m in 2014 to Sh 365m in 2017, with a corresponding increase in the number of companies registered daily up from an average of 30 per day in 2014 to 200 companies daily as at the end of 2017,” said the President to illustrate the growth of Kenya’s economy. The President reiterated that the war on corruption was work in progress. “We are systematically closing down the loopholes in government procurement processes that create easy opportunities for graft,” he said. The Head of State reassured the business community that the criminal justice system had been strengthened and its capacity enhanced all the way from the investigative agencies to the judiciary. “We continue to cooperate with international agencies to monitor and recover the proceeds of corruption,” he added. On his part the Deputy President said the WB report marks a proud moment for Kenya but the country should not forget to pursue its target for position 50 globally by 2020. The DP said there was also need to reduce some government processes in the registration of business, reduce corruption and restore integrity of our system to expand the economy. “ We must remove the many processes in business registration, digitize and restore the integrity of our system”, he said.